"Can I have A2 on my steak?" There was much excitement at our house tonight. It was grocery store day so there were lots of yummy foods being unloaded today. Among those goodies was a pack of steaks. We don't eat steak very often at the Hawkins home. There are a few reasons why. One because it costs so much to buy a good ribeye and it "has" to be a ribeye (medium rare). Two, because my boys love steak, thus the first reason all over again, it takes a lot to feed those 4 little mouths. Also, and this might be a little TMI, but we can never find dental floss when we need it and you have to have dental floss after having a good ribeye. Our dental floss seems to always be used to make traps rather than to remove trapped food from your teeth. Anyway, we did have steak tonight. The Meat Store had a special 5 ribeye steaks for $20. We couldn't resist. I was doctoring up the potatoes while Matt was cutting up the steak for the boys. I must confess to you that I have a real problem with ketchup or ranch on a steak (yuck). To quote a dear friend..."That poor cow ain't never done nothing to deserve that." But my children insist on dipping their steak in something so I asked the usual steak dinner question..."Joshua, would you like A1 with your steak?" "No Mommy, but can I have A2?" I laughed that really deep, raspy, belly laugh. (A2?) What made him ask that? Why not A1? What's wrong with A1? Nothing, he just liked his idea better. After all A2 is original. No one else has A2. Then it dawned on me. I do this to God all the time. I want what He is not offering. I want something else. I want something that doesn't exist in my life. I want something new. I can never be satisfied with what sits on the plate in front of me. For goodness sake, I have steak with A1, but nooo I want A2. Now, I really don't think Joshua was being discontent or ungrateful. I think he was innocently asking, but my asking is not always so innocent. I have my dream husband, I have 4 incredible children, I drive my favorite van, I have my Macbook...I could go on and on with the blessings He has poured out on me, but guess what? I still want A2. Well, maybe not A2, but a digital cannon rebel, a new flatscreen TV for my bedroom, a hot tub (hey, a girl can dream)... Don't judge me, you know you have your list too. The truth is, I don't want to have a list. I am very content with my life. I LOVE my life. I have so much more than I could ever imagine, but I confess there are days I get caught in the trap. The trap of not being content to eat the steak, but wanting the A2 to go with it. Wanting something that is out of my reach, something that is not in God's plan for me. Why is this? Because I allow myself to take my focus off the one who died for me and blesses me beyond my imagination and I turn my focus to the electronics isle at Target. I focus on what the Jones's have and wonder why I don't have it. I am content. My heart is content and blessed beyond measure. I face a choice each day. I can receive my steak dinner with a heart of thankfulness, contentment and overwhelming gratitude or I can make my A2 list. I choose to savor and enjoy each bite. I need nothing else. All I need is Him. Thank you Joshua for encouraging me to adjust my focus and have a content heart. "Oh Be Careful BIG Mouth What You Say." I feel the need to start by telling you that if you had asked me years ago if I would be raising 4 little boys I would have thought you were crazy. Me and little boys just didn't seem to make a good fit. I have been known to be prude like. 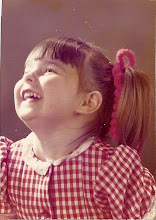 I despise gross noises and there was a time when I was very proper in everything I talked about. Conversations that included nakedness, fighting, bodily functions and the like would not have been discussed in my presence. Now I am blessed to be raising 4 little men and I don't look quite so prudish anymore. Don't get me wrong...I still believe in manners but I have lightened up a lot. 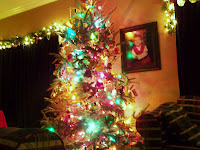 Last Monday night we were sitting around cuddled up as a family talking about Christmas. Joshua said, "Mommy, what do you want for Christmas?" "Well, Joshua I could use some lavendar vanilla candles and a new food processor. I would love a macbook, but I know that won't happen." Matthew says, "Mom what would you do if you got a macbook?" Leaving my prudish ways behind and hoping to get a laugh from my boys I said in what is now apparent little faith, "If I get a Macbook for Christmas I will run down the street naked." Bahahha! The thought of this is pretty funny to little boys and seemed pretty safe to me because I know Matt Hawkins and I also know how much those computers cost and Matt has been very clear that when we save enough we can get one, but delayed gratification. Sunday morning was our children's play and then we had a creative team meeting at our house right after church. I lit a fire and everyone was making homemade hot chocolate when my husband hands me a card. (This seemed a very odd time to be getting a card, but let's just see. "To My Darling Wife" this is what the front of the card said. Now I was curious. What timing? Why in the middle of a creative team meeting? I opened the note and it read... Please excuse yourself to the back, The time has come for you to pack, One bag is all you and I will need, One more for the other one plus three, Christmas pajamas is all they need, to spend the night with papa and mimi, as for you and me, we shall need what folks normally wear to dinner and a movie, this time where you and I shall go, is for you to guess and me to know, so please bid our guests a fond adieu, for pop pop and grandma arrive at two. I sat on the couch in shock and began to cry. I am married to an incredible man every day, but then he goes and does something like this and blesses me beyond what I could ever deserve. We got in the car and started driving. I soon realized we were on our way to Birmingham. I knew because we were on 280 and because I saw a Popeyes Fried Chicken. Landmarks...you have to know your landmarks. We pulled up at our hotel and checked in and Matt said we needed to hurry up and drop the stuff off because we were going to a movie at 5:15. There was a show coming, but it was not at the theatre. We arrived at The Summit a little early and we were waiting on our "movie" to start when Matt said, "Hey let's walk in the Apple store." Groaning I followed, but I knew the drill. We would go in, we would look, I would dream, I would covet, I would become discontent and we would leave with me needing to go before the Lord with some confessing and in need of an attitude adjustment. All things considered I followed my husband and convinced myself to be strong and keep my hands in my pockets so I would not be tempted to come in closer contact with my dream than I needed to. We looked and then Matt did something he never does. He asked the apple man for some help. I stood confused, but still keeping that guard up. They chatted and talked about gigabytes and megabytes and then I heard something I understood. It was not computer jargon. I heard the words "We'll take it!" I heard the words, but were they actually coming out of Matt's mouth. My jaw fell open but no words would come out. I saw that out of the corner of his eye he saw my astonishment and he had this adorable grin on his face, but he did not make eye contact with me. When Mr. Apple walked away I fell into the arms of this incredible man and I was overwhelmed. We left there about 45 minutes later and I was a Macbook owner. Can you say cloud nine? As we walked to the car Matt said well guess who has to walk down the street naked. OH MY WORD! I had forgotten about that. What had seemed so impossible on Monday and had driven me to take a self inflicted dare, was now a reality. OH be careful little (BIG) mouth what you say. I called the boys to tell them about my wonderful surprise and they all said, "Oh no you have to walk down the street naked." Would they really hold me to that? Could they actually think I was serious? We encourage them to let their yes be yes and their no be no and to always be true to your word, but does nakedness and a possible arrest count. Of course we talked about it when we got home. Matthew was a definite "No mommy we don't expect you to do that. It was just a joke. It would totally not be appropriate." And then there's Joshua and Caleb..."Mommy you promised, you have to do it, You can't go back on your word." OK are we really even debating this. I mean it is 30 degrees, I have bronchitis and I will not, do you hear me I will not, now or ever run around outside naked. SO I say "Guys you know mommy could go to jail for going outside without her clothes on." Caleb thought for a moment and said, "Well I guess we could bring your gifts to the jail. Would they let us?" Merry Christmas Momma!! Joshua said, "I'll be satisfied with the bet if you will just run outside naked and touch just one foot on the grass. They won't throw you in jail for that." After being surprised that the conversation went on that long in steps Daddy. "Hear me now, no one will be leaving this house naked. It was a bet. Mommy is not breaking a promise, she was being funny. We will not hold her to that." And Mommy will be more careful what she jokes about from now on. Children take us at our word. They are very literal. I am revisiting going back to my prudish ways. Oh so the word naked has been used a lot and that is really not what I want you to walk away remembering. "You know that lady that wrote that naked blog." First I just want you to know how blessed I am to have such an incredible, thoughtful husband. Second, it made me realize that the things we view as impossible are the very things God desires to make possible so He can show himself to us through them. In my mind a macbook was impossible, thus my offer to walk naked. (Please know that I never intended to do that nor would I ever do that. It was to get a laugh out of my boys who took it a little too literal.) God made the Macbook possible through my husband's hard work and his creativity. I do love the macbook, but I received something even greater this weekend than a macbook. I received an opportunity to grow in my marriage and to build my admiration and heart of thanksgiving for my husband. Not because he bought me the computer, but because he loves me so much that he wants to spend time with me. He secretly planned this whole thing. He loves me that much. Not that I ever doubted it, but oh how wonderful to be shown that love in a very special way. I lay here tonight basking in the blessings of my life. Happy that I am loved, that I have humorous children, that I am fully clothed and warm and that I am typing from my new macbook as my wonderful husband snores beside me. This holiday season bask in your blessings, remember that the thought and the heart that goes into the gift is greater than what's in the package. Remember to be careful of thinking NEVER and taking absurd dares because of a lack of faith. God can do immeasurably, abundantly more than all we could ask or imagine. Jesus said, "Warm her hands!" I was in Kroger on Friday. I am sad to say that it was my third Kroger trip of the week. I can't seem to stay organized these days. I had less than 15 items and since I despise the self-checkout I decided to go for the 15 items or less line. It was long, but how long can it really take if everyone only has 15 items. As I unloaded my plunder on to the conveyor belt I noticed the lady in front of me rubbing her hands together. The hands were wrinkled and her knuckles were swollen showing in every crease the long life she has lived. Looking at her hands I wondered how many babies she had loved, how many biscuits she has patted out and how many times those hands had brought comfort to someone special in her life. I noticed that even though her skin was a natural brown or chocolate color, her knuckles were red and she couldn't bend her fingers. She turned my way and I ask, "Are you cold?" "Oh honey, I am freezing. My hands stay cold. They are cold in August, but in December when it is 30 degrees I can't even feel them. They hurt so bad." I offered to buy her some gloves, but she had gloves in the car and that wasn't helping at the moment. I continued to unload my groceries, patiently waiting my turn. As I unloaded the chicken, bread and sour cream I noticed that my hands were really warm Actually HOT! Then I heard Him! The voice of my Savior..."Warm her hands." "I tried to buy her some gloves God, what else do you want me to do?" Again I heard, "Warm her hands." There was no out loud laughter, but in my mind I thought...surely Jesus would not ask me to hold the hands of a total stranger. "I don't have any purell and Jesus what will all these people think?" Again I heard..."Take her hands, hold her hands, warm her hands." I would like to say that I grabbed them right away, but still I wrestled with the question.."Why God, what purpose could you possibly accomplish through me holding a strangers hands." And Jesus said, "She's not a stranger to me." I turned to face my new friend and ask, "Are your hands feeling any better?" "No honey, they so cold." I held my hand out and said, "May I feel how cold they are?" As I took both of those wrinkled, ice cold hands in mine I kept hearing Jesus say..."She's not a stranger to me." Her eyes got big as she smiled and said, "Oh my your hands feel so warm. They are like an oven." I continued to hold her hands and rub them between mine. She thanked me over and over and paid her bill with stiff fingers, but now able to bend them enough to count out her payment. She said, "thank you again dear." And she was gone. I don't know her name, I don't know where she lives and for all practical purposes she would still be considered a stranger to me, but Jesus said, "She is not a stranger to me." I will be honest, I have still struggled with Why God? I mean I like to have reasons behind everything, but was this just a matter of obedience. Yes, I know my Jesus wanted to know if I was listening and would I obey even when I didn't understand. I know now that God was getting my focus off of me. He was broadening my view. I walk in Kroger all the time, check out and rarely give a thought to those in line with me unless they are taking too long to pay or they have way too many items and then I notice "that" with a little aggravation. Jesus said, "She's not a stranger to me." She is not a stranger to the one I walk and talk with everyday. She is not a stranger to the one I long to be with, to spend eternity with. She is not a stranger to the one who knows my inmost thoughts, my coming and my going. If she is not a stranger to Him, then she is not a stranger to me. How many others have I passed by labeling "stranger" when in actuality they are family. (God's family) My Kroger friend may have left there with warmer hands, but I left there with a transformed heart. No longer do I need purell after touching a stranger for that stranger is a friend of God's. I can embrace, I can seek, I can search out and I can obey as my Jesus allows me to be His hands of love and warmth to His people. Matthew 25:40"The King will reply, 'I tell you the truth, whatever you did for one of the least of these brothers of mine, you did for me. "Talent Turns To Testimony and The Things Memories Are Made Of." Last night around 6:30 Caleb informs me that he wants to be in the talent show at school in the morning at 7:30. Now this was the first I had heard about a talent show that would begin in approximately 13 hours. Caleb decided to play the guitar, which he does very well. Problem...his guitar had a broken string and needed to be tuned and he happens to be the only musically inclined person in our home. God has strategically placed us on a street, in a neighborhood that we love, with incredible friends and neighbors. Mr. Nate to the rescue! Mr. Nate went to Target and bought new strings and put them on Caleb's guitar and he tuned it for him. Caleb was ready to show off his talent. Matthew then decides at 8:00 that he wants to be part of this talent show. After all it was going to be held in the multi-purpose room for the whole school and a $50 dollar gift card was the grand prize. Sign me up...I got talent! Well after 30 minutes we finally decided on a good talent for Matthew. He would accompany Mercy Me's "Little Drummer Boy" by playing the snare drum. So by about 9:30 we were ready, instruments by the door and a plan in place. We were sure a Hawkins would take first prize in the "talent show." We marched in the front doors of the school noticing a few strange glances as we carried the cumbersome ticket to our gift card. The principal met us in the hall and was curious as to what the Hawkins boys were doing with instruments. "We are going to be in the talent show." "What talent show?" "You know the talent show that is in the multi-purpose room for the whole school with the gift card prize of $50 for the winner." "Guys, I haven't heard about that." "Well, our cousin is in the 3rd grade and she is in a talent show." The principal walked them down the third grade hall to investigate. There was in fact a talent show, but just for that one third grade class and the talents did not involve instruments, but poetry and songs "just for the class." My children had not checked out the facts. They were embarrassed as was their cousin, but then something beautiful happened. 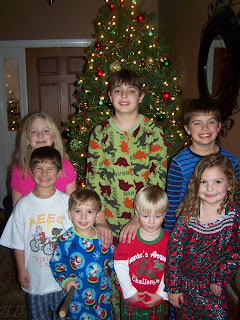 Something that took mere talent and turned it into a testimony and some fabulous memories for these precious cousins. This third grade teacher along with the principle asked if the boys would like to share their talents with this class and their parents. After getting the go ahead from their teachers, they stood before the third grade classroom and shared their talent. Keep in mind that we attended a program earlier this week for Joshua where the words to We Wish You A Merry Christmas were re-written to say We Wish You A Happy Holiday, We Wish You A Happy Hanukah, We Wish You A Happy Ramadan and A Happy New Year. So needless to say the presence of Christ is not openly advertised within our schools, but let me tell you that His presence was felt there today. Caleb played a song he had written that said "Jesus, we worship you. All day long we worship you. Only you do we worship. We worship you." Matthew played his drum as the children and teachers heard these words...Come they told me, Pa rum pum pum pum, A newborn King to see, Pa rum pum pum pum, Our finest gifts we bring, Pa rum pum pum pum, To lay before the King, Pa rum pum pum pum, Rum pum pum pum,So to honor Him, Pa rum pum pum pum, When we come, Little Baby, Pa rum pum pum pum, I am a poor boy too, Pa rum pum pum pum, I have no gift to bring, Pa rum pum pum pum, That's fit to give the King, Pa rum pum pum pum, Rum pum pum pum, Shall I play for You?, Pa rum pum pum pum,On my drum, Shall I play for You? Mary looked at me and nodded, The ox and lamb kept time, Oh I played my drum for Him, Oh I played my best for Christ, Then He smiled at me… As Matthew finished the class erupted in applause and Ashlyn, Matthew's cousin jumped from her seat and ran up front and hugged Matthew with such a look of appreciation and love. As I looked around the room, I noticed there were tear filled eyes. Even the teacher had her hand over her heart and said..."Oh my that was wonderful." Let me set the record straight and let you know that Matthew is no expert drum player and Caleb is no professional guitar player, but what their peers, parents and teachers saw today were children who love the Lord and family (cousins) who love each other, cheer for each other and share a common love for Christ and for hearing His name proclaimed. You could not have left that room today and not have been touched by the love these kids had for one another and the love they share for the Lord Jesus. Who says Christianity is dead in the school systems? I assure you it was alive in the hearts of three precious children I know today. As long as it is alive in their hearts and lives, it is a testimony everywhere they go. We could have all been embarrassed today and rushed the instruments to the car and never mentioned another word about this day, but I believe in my heart of hearts that this was not mis-information, but a divine appointment destined in eternity past for these children, for these teachers and for these parents to hear the testimonies of these precious cousins. The truth of Christ may not be openly shared in our school systems, but as long as we are encouraging the hearts of our children and they love Jesus...He is ALIVE and His WORD is ALIVE in our schools. We made some precious memories as a family today, but my prayer is that lives were touched, even just one. "Where Is Your Center of Gravity?" We went ice skating on Wednesday with some very dear friends. Well, the "we" may be stretching it a little bit. The boys and Matt ice skated with our friends and I cheered them on. The boys wanted to know why I didn't ice skate. There were many reasons. The one I liked the best was the make-believe reason, "That I use to be an olympic figure skater and I did not want anyone else to feel bad." The real reason was that I have 4 children and to take care of and I cannot afford to break anything, I tried years ago and wasn't that good and that was 80 pounds, 4 c-sections and 2 cancer surgeries ago. Not to mention that nobody wants to see this body hit the ice. I mean really! Matt skated close to the wall, never actually touching the wall, but close enough so that he never gave the appearance of falling. Matthew was the picture of diligence. He tried, he fell, he got up and tried again. He never complained and he never gave up and he came home with lots of bruises thanks to the encounters his knees had with the hard ice. Caleb's goal was to see how fast he could skate without falling. He could be a speed skater. And then there was Joshua. 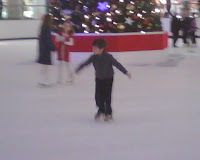 He is 5 years old and has never been ice skating before. I think he has only roller skated maybe once or twice. I watched him closely as he nervously put on his skates and cautiously approached the ice. He stayed close to the wall his first 3 times around and then he started skating. I mean really skating. He was skating in circles. He was skating backwards and was doing tricks. I was amazed. Thirty minutes on the ice and he was awesome. As Matt and I sat watching in awe we wondered why it came so much easier to Joshua than it did to the other 10 beginner skaters that were there. Matt noticed that his center of gravity was closer to the ice than anyone else's. He would occasionally fall, but he was so close to the source that it did not hurt as much to fall. His center of gravity was so close to the source that it was easy to accomplish the goal set before him. He was also watching other skaters who were taking lessons from coaches and who had been skating longer than he had and he was learning from watching them as they followed their coach. The more I thought about how well he did skating, how easy he made it look and how the longer he remained on the ice the more he could do and the better he got, I began to ask myself..."where is your center of gravity?" "Is it close to the source?" Joshua has begged each day to return to the ice. He longs to get those skates back on and see what else he can learn and do. I want my center of gravity to be so close to the source (Jesus) that when I fall, I don't fall far and that it doesn't hurt quite so much. I want to stay so close to the source that I can become one with my Jesus, my savior just as Joshua was becoming one with that ice. I want to learn new things and I want to walk so close to my Jesus that it looks easy and it is easy because I know Him so well. I want to be so close to Jesus my source that the goals and tasks He sets before me are easy because He is my center of gravity. I want to glide in His presence. I want to pirouette before my King. I want to twirl and spin and jump in the air for Him. I want my center of gravity so in line with my source that my entire life revolves around the source. Jesus Christ! I want others who haven't been skating with the Savior as long as I have to be able to look at me and learn more about Him. As I follow my coach and stay close to the source I want to help others do the same. Where is your center of gravity? "But the fruit of the Spirit is "responsibleness"?" Before I begin I want to make a disclaimer and tell you that my Caleb is one of the funniest, most talented kids that I know. He keeps us laughing all the time. He has an extremely quick wit and is very laid back until it comes down to playstation football. Caleb likes to win! He has been known to repeatedly start a game over when loosing to ensure that it does not get recorded in the computer and if by chance someone else wins, then they must have cheated or the equipment was not working properly. Now I love that he has a heart to succeed, but this week it went a little too far. I am one of those moms who said I would NEVER have a television in my child's room and I am also one of those mom's who has learned to NEVER say NEVER. We have a rather large television in the boy's room that was given to us by their grandparents and it is an awesome screen on which to play video games. (Don't judge me!) On any given rainy day you can find at least 3 but usually 7-9 boys huddled around the screen trying to have their day of glory as they take their electronic hero down the field for a touchdown. On this particular day Matthew, Caleb and Joshua were playing football without the aid of their neighborhood teammates. Apparently Matthew was beating Caleb pretty bad and in a fit of anger, maybe rage or just a plain lack of self-control, Caleb ripped the glass doors from their hinges and the TV stand was left open to all the elements in the Hawkins' home, namely Jacob. It seems that no one felt the need to inform Mommy and Daddy of this. Maybe it is some "brother code of loyalty" that I do not know about, but nevertheless it remained a secret until I went in to vacuum and found the doors neatly hidden "behind" the television. I think my exact words were..."What in the world happened in here?" Caleb's response was "Looks like I've been working out. I'm stronger than I thought." These are the moments that you want to laugh, but you dare not for fear that the punishment to come will not be as effective. I called for backup (aka Daddy) and we quickly informed Caleb of the severity of the situation. Matt was able to repair the TV stand, but the bigger, more important repair was Caleb's heart. I want to raise children of Godly character, not consumed by the acts of their sinful nature, but walking victorious over sin as they seek God's word and listen to the Holy Spirit speaking to their hearts. This is my mission and I have chosen with gladness of heart to accept it. Matt told Caleb that he was not allowed to play Playstation until 2010. (Sounds like forever, but actually it is only 3 1/2 weeks away.) And he is to have Galatians 5:22-23 memorized by the end of the week. Matt asked Caleb if he knew the fruit of the Spirit and began to list them...love, joy, peace, patience, kindness, goodness, faithfulness, gentleness and do you the know the last one. Caleb answered "Is it something like responsibleness?" "Caleb Galatians 5:22-23 says "But the fruit of the Spirit is love, joy, peace, patience, kindness, goodness, faithfulness, gentleness and self-control." 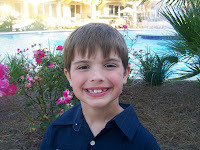 Caleb prayed to receive Christ as his Savior in August. Now it is time for Him to understand the truth of Psalm 119:129-130"Your statutes are wonderful; therefore I obey them.The unfolding of your words gives light; it gives understanding to the simple." I want Caleb to understand how incredibly awesome it is to go to God's Word and to see it unfold and shine the light of truth on every part of our lives. God's Word is personal, it is true, and it provides the wisdom we need to overcome this world and the sins of this world. Caleb was faced with a choice- He could allow the Holy Spirit to fill him with self-control or he could, in a fit of rage, pull the doors from their hinges. He chose poorly. As his parents we are taking him to God's Word and helping him understand that as he unfolds the Word and obeys it, our furniture can stay in tact, but more importantly he can grow to become a man who honors God in his words, his actions and his attitudes. I pray that we too will unfold God's word and allow its light to shine in our hearts so that we can obtain wisdom and understand and obey His wonderful Word. "Twelve Days Until Christmas Break"
The boys and I wanted to do something special for their teachers for Christmas. We thought about different gift ideas, but could not come up with anything that truly shared the hearts of my boys or really focused on the true meaning of the season. We wanted to share with them the love of Jesus and do something that the boys could help put some thought and love into. We decided to share and give to them for the 12 days before Christmas Break. Here is a poem that I wrote for their teachers. We are sending a little gift each day to show them that we love them. Try it. I pass it along to you!